40 year old goalkeeper Brad Friedel has signed for Tottenham Hotspur in a free transfer from Aston Villa in what is believed to be a two year deal at the London club. Despite seeing fellow 40 year old keeper Edwin van der Sar retire at the end of this season, Friedel has no such plans to end his playing career and has joined up with Spurs who will be competing in the Europa League next season as well as aiming to break back into the top four of the Premier League. The American keeper who first moved to England in 1997 when he signed for Liverpool has racked up an impressive 400 games in the Premier League which has included a run of not missing a single league game since 2004 with Blackburn Rovers and then Aston Villa. Friedel also holds the distinction of being one of only three goal keepers to have scored a Premier League goal, Paul Robinson and Peter Schmeichel being the other two, coming for Blackburn away at Charlton. 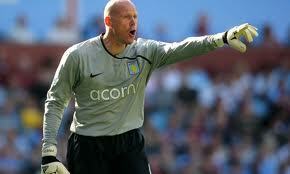 Friedel is thought to have rejected a number of other offers from clubs including Liverpool and West Bromwich Albion as well as a new deal from Villa before deciding to join Harry Redknapp’s side. With Heurelho Gomes and Carlo Cudicini already established at Spurs, the competition for the number 1 spot will be healthy and is probably the strongest line up of goalkeepers in the league. Cudicini recently signed a new extension to his deal at Spurs but there have been rumours surrounding the future of Gomes and a possible move away back to his old club PSV Eindhoven. Although into his 40s, Friedel has proved he still more than capable of performing at the top level and now that he has been confirmed as a Tottenham player, the battle begins to see who will be starting between the posts come the new season.